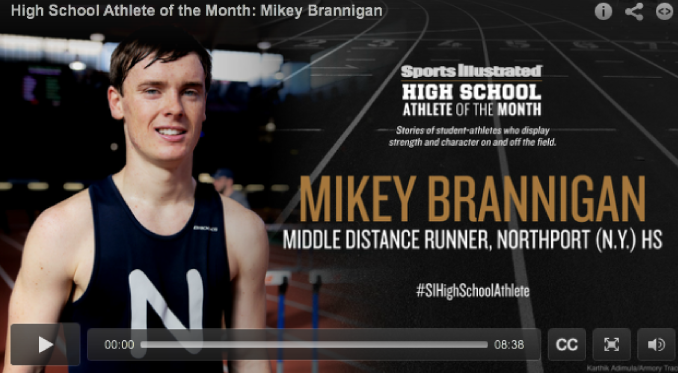 Track & Field phenom Mikey Brannigan was named High School Athlete of the Month by Sports Illustrated! Great video that recognizes how with the support of parents, siblings, coaches, schools and programs like Rolling Thunder athletes like Mikey can go beyond any limits. Brannigan, who hails from New York, and Michael Murray from Tennessee, were named to the 2015 US Paralympic Team roster competing at the prestigious 2015 ParaPan Am Games in Toronto this August. Both runners are medal contenders and will compete in the T20 class for athletes with intellectual impairment. Brannigan is currently the American and World record holder in the men’s T20 1500m with a time of 3:48.85 earned at the 2015 US Paralympic Track & Field Nationals.